A Journey into Steinbeck's California by Susan Shillinglaw shows readers how towns like Monterey and Salinas influenced the author of The Grapes of Wrath and Cannery Row. Of Mice and Men, according to the author of A Journey into Steinbeck's California, 'is, perhaps, the book that makes readers out of more high school students than any other.' Known for classic novels like The Grapes of Wrath, Cannery Row, East of Eden, The Pearl and The Winter of Our Discontent, as well as some great non-fiction includingTravels with Charley, A Russian Journal and Once There Was a War, John Steinbeck was a worthy winner of the Nobel Prize for Literature in 1962. The author of A Journey into Steinbeck's California, Susan Shillinglaw, knows her subject intimately. As well as being Professor of English at San Jose State University, she is the Scholar in Residence at the National Steinbeck Center in Salinas. 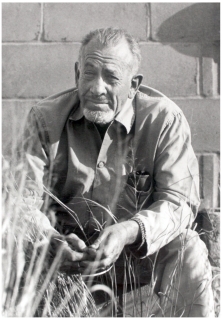 John Steinbeck was born in Salinas, California, and lived in various places throughout the state which influenced his writing so much. Shillinglaw traces Steinbeck's personal and literary journey through California, and while this is in no way an in-depth biography of one of America's favorite authors, the reader gets to know Steinbeck in a more personal and intimate way. The book is fully illustrated throughout, and we get to see Steinbeck's houses, the view through his window, see the landscapes he saw, the places he worked, meet his wives and his friends. A Journey into Steinbeck's California is no dry academic study or biography, but a warm portrait of a man by someone who has the ability to see California through his eyes, to show us its influences on him, and to recreate the times in which he lived. It's those glimpses of 'small human stories’ which make Steinbeck such a great writer, whose work will last longer than many of his contemporaries who were more interested in shouting about their own lives than in quietly describing the lives of other people. To Steinbeck ordinary people were extraordinary. Susan Shillinglaw is a skilful and evocative writer herself. 'Steinbeck,' she writes, 'never again lived in the Salinas Valley once he left home at age seventeen. But the smells and sounds and sights of his home valley never left him.' 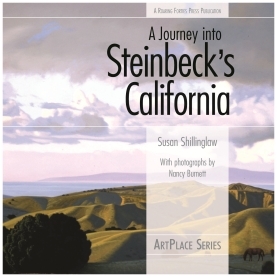 For those of his readers who have not yet visited Steinbeck's California, this book in the impressive ArtPlace series from Roaring Forties Press is the next best thing.